Wifi Calling – Make cell phone calls without using cell phone towers! Living in rural Idaho definitely has its perks. From fantastic views to wide-open spaces, Idahoans are proud to live off the beaten path. Yet dirt roads and clean air come with a price tag, too. Our majestic mountains and winding highways often make it difficult to get reliable cell phone coverage. Service in Idaho is “spotty”, and in some circumstances, chasing down a signal feels like searching for the elusive Bigfoot… it’s simply nowhere to be found. Thankfully, there’s a trending new technology that has Idahoans giddy with yeti-found excitement. And the best part? It probably won’t cost you a dime. Introducing Wifi Calling – a handy feature that lets you make phone calls WITHOUT using cell phone towers. Just as the name suggests, wifi calling places calls (or text messages) over a wifi network instead. This cool technology has actually been around for years, with companies like Skype using internet-based calling since 2003. With free wifi networks popping up at airports, coffee shops, and retail stores around the world, wifi calling is fast becoming a common household term. Wifi calling is best utilized during conditions where cell phone coverage is “spotty” or non-existent. Large office buildings and concrete structures are prime examples. These locations typically have good wifi, but cell signals may have trouble penetrating the concrete and steel exterior walls. Have you ever tried making a cell phone call inside Home Depot or Lowes? The struggle is real. Frequent travelers also use wifi calling to stay connected while traveling outside their local calling area. Imagine you are on vacation trekking in Nepal. Chances are your cell phone won’t work with local service and an international calling plan can be outrageously expensive. But even in Kathmandu there are coffee shops with wifi. Just connect your compatible smartphone to the wifi network and BOOM! You can now make and receive calls just like if you were at home. Wifi calling is also a great tool to have in case of an emergency. If your cell phone carrier experiences an outage, you can still make wifi calls using your home internet. As convenient and common as wifi calling has become, it’s still not a perfect science. Call quality can be sketchy and dropped calls are common. 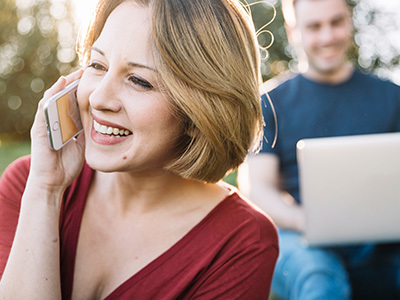 While it’s a great alternative to “spotty” cellular coverage, it’s rarely advised to be a replace-all mechanism for all your traditional calls. Additionally, not all smart phones or cell phone providers support wifi calling, and international calls are almost always billed extra. Please contact your cell phone provider for full details. To learn more about how to enable wifi calling on your iphone or android, please click here.